Although most users log in to Windows with a simple username and password, some other forms of getting into your computer's operating system are becoming popular and with the rise of mobile phone usage, face tracking software has become especially popular. KeyLemon is a product which offers this to users. What KeyLemon can do is transform your Windows login screen into something a little bit more modern and by modern, we mean fun! All you have to do is make sure your webcam is plugged in, smile and you're set to get. Version 4.0.3 is a freeware program which does not have restrictions and it's free so it doesn't cost anything. 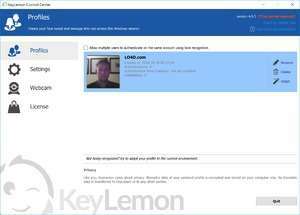 For security reasons, you should also check out the KeyLemon download at LO4D.com which includes virus and malware tests. Additional screenshots of this application download may be available, too. KeyLemon has a presence on social networks. KeyLemon download been highly rated by our users.